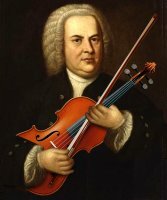 A famous portrait of the esteemed composer Johann Sebastian Bach is cleverly “doctored” to show him holding a viola. The result makes a wonderful gift design for anyone who has experienced the magical bliss of either playing or listening to Bach’s music performed on viola! Purchase the unique “Bach with Viola” design now on a t-shirt, hoodie, mug, or various other apparel and giftware items for your favorite violist or viola teacher – even for yourself, perhaps – exclusively from GearGems!